Chrome OS 72 began rolling out to the masses yesterday and brought a slew of new features and updates along with it. You can check out Gabriel’s article that outlines all the new stuff users can expect with the latest update, but there was an addition baked into Chrome OS 72 that Google didn’t exactly disclose in the release notes: Google Assistant for all Chromebooks is here. However, while the Assistant came along for the ride in Chrome OS 72, it is still hiding out behind a few flags and isn’t readily available right out of the box after you update. So, we wanted to walk you through a few steps that will get you up and running with the Google Assistant on your Chromebook. Before we get going, there are a few things you need. The biggest of these is a Chrome OS device running Chrome OS 72. Though it began rolling out yesterday, it isn’t on every Chromebook yet. 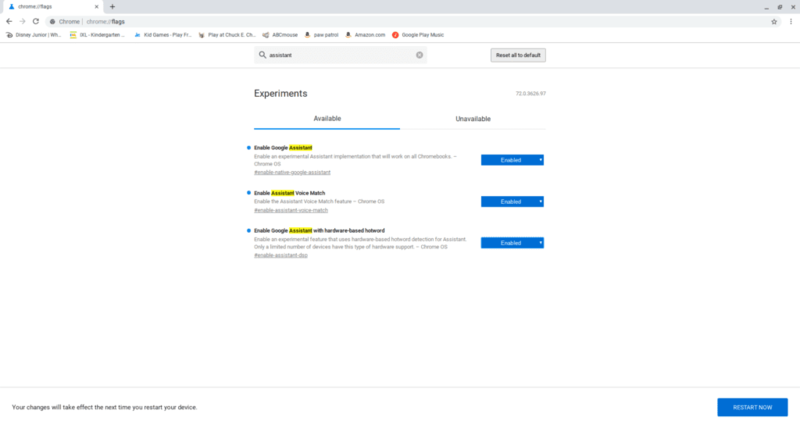 Rest assured, the roll-out is supposed to happen over the next couple days, but if you simply can’t wait to try this out, you can hop over to the Beta Channel of Chrome OS. We’ve tested 5 devices that don’t have 72 in the Stable Channel and all 5 were able to utilize the Assistant in Beta. Keep in mind, if you make this move you will have to wipe your device completely upon your return to the Stable Channel. The move to Beta won’t affect your data, though, so feel free to give it a try if you are feeling experimental. After all, wiping your device from time to time and realizing you can be up and running again in a few minutes is one of the best parts of being a Chromebook user! I’d say if you don’t know what I’m talking about with Beta Channel and Stable Channel, it is best to just wait for 72 to come to your Chromebook through the standard update channel. It will only be a couple days! Either way, once you have Chrome OS 72 up and running, we can get started enabling the Google Assistant. You’ll need to turn all three of these on. They are pretty self-explanitory, but one flag turns on the Assistant, one enables voice match (your stored voice data the Assistant uses to identify your unique voice) and the other enables hotword (“OK Google”) activation. Don’t worry, you can turn off the active listening for “OK Google” in the actual settings later. Once you have these enabled, you’ll want to hit that restart button that appears at the bottom right corner of your window. Once you’ve restarted, you can now enable the Google Assistant. Go to your settings and click the hamburger menu. You’ll now see a new section called “Search and Assistant” in the fly-out menu. Click on that and you’ll head to a screen where the third option allows you to toggle on the Google Assistant. Once you do, you’ll have a group of settings that you can choose to toggle on or off based on your preferences. For instance, I’m not a huge fan of all my devices always listening for the “OK Google” hotword, so I usually turn that off. Congrats! You now have the integrated (non-Play-Store-dependent) Google Assistant on your Chromebook! The last thing we need to cover is the clever little shortcut Google has added for Chromebooks without a dedicated Assistant key. You can use this to bring up the Assistant at any time without uttering a word and this is especially useful if you turn off hotword listening. Simply press Search + A and your Assistant will hop into action, ready to answer your queries or help you control the smart devices around you. From what we can tell so far, the whole effort is a tad buggy, and the microphone won’t listen from time to time. Keep in mind this entire project is still behind flags, so there are still a few kinks to be worked out. However, if you want to get in on using the Google Assistant on your Chromebook right now, there’s nothing stopping you now!